After an afternoon of walking through the Riverdale Artwalk by the Jimmie Simpson park this past Sunday, Guinevere Pura and I was ready for a very filling dinner. Trying to think of a place that would fit the bill, I thought of Mr. Tonkatsu. I have long wanted to try the place when I read a review from a fellow food blogger, Stella Yu, author of Food Junkie Chronicles. I learned about tonkatsu back in Manila. It has always been a staple sustenance for me in a Japanese restaurant when for some reason I am looking for another dish other than my usual tempura. I loved its texture to the bite, panko-crusted on the outside and moist pork cutlet on the inside. It is always best when it is just fresh out of the kitchen. When I saw Stella mention the opening of Mr. Tonkatsu by east of Bloor and Bathurst, I knew I just have to try it. It was a definite plus that when we walked in, it was early for the dinner crowd. The place was only half full and we were able to get the table by the window. The place was decent in size with quirky art work sporadically scattered throughout the restaurant. I even loved their washroom signs where each door was adorned with piggy Batman and Batgirl juxtaposed with a pretty floral mural to greet you as you draw closer. Checking up their menu, I found an item that is even better. I found Katsudon. Katsudon was a meal in bowl with rice at the bottom, topped with the tonkatsu with a generous amount of julienned vegetables and an egg, usually fried. Instead of the usual fried egg I get from the dish, their version actually have a poached egg. I actually prefer it as it made the dish lighter than what I am used to. When the dish arrived, it was actually prettier than what they have in the menu. 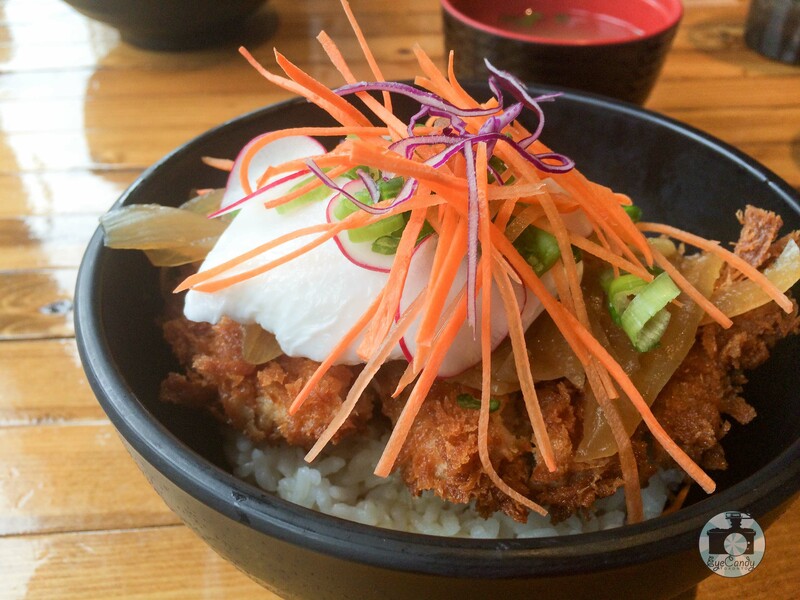 It was just my kind of a meal – rice, crispy pork and I even have my share of veggies. I loved every bite and when I was finished, I have that contentment to have ended the day at such a good note. Comfort food always does that to me.